With endless ways to incorporate the charm and character of timber frames in your home’s exterior, get ready to discover your property all over again. 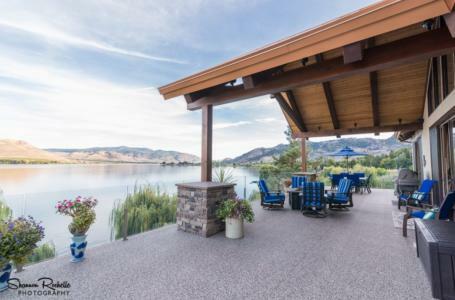 From timber frame pergolas and gazebos to grand outdoor kitchens and entranceways, you’ll experience outdoor living in a whole new way. A deck is where summer memories are made. It’s the place where families and friends gather for potluck barbecues and watch the kids play freeze tag in the backyard. 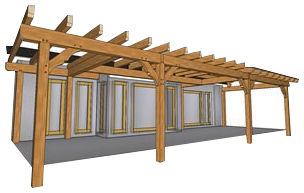 You’ll enjoy it all the more when surrounded by a carefully constructed post-and-beam deck by European Timberframe. Built to exacting precision using the finest Douglas fir locally milled in the Okanagan, you’ll enjoy years of celebrating life’s simple moments in your backyard. Every home with a garden or view needs a place to admire it from. Placing a timber frame gazebo in amongst your prized rose garden offers you a shady locale to immerse yourself in your surroundings, with the added comfort of shade. 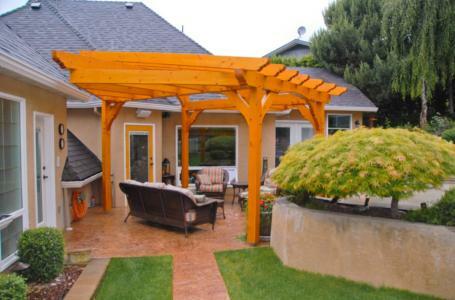 A timber frame pergola or pavilion is the ideal choice for covering your patio set to protect you and your guests from the elements. 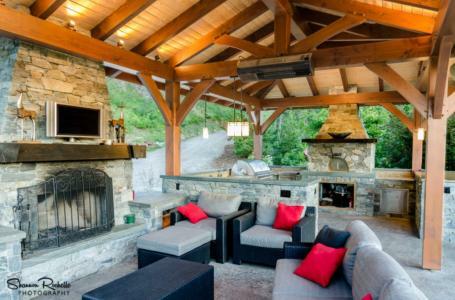 What started with a barbecue and spatula on the back deck has transformed into a full-blown outdoor food preparation, dining and living area. 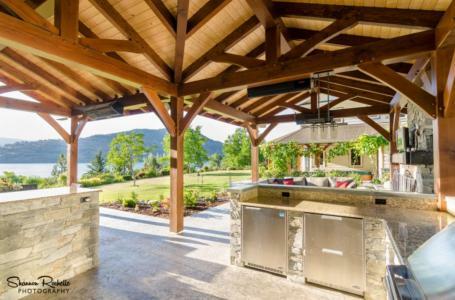 Outdoor kitchens and living rooms have become the must-have accessory for Okanagan summer homeowners, and many of them are choosing to protect this significant investment with a custom timberframe roof system for their sturdiness, customization and the charm of exposed timber beams. Every luxury home should have an entrance to match. 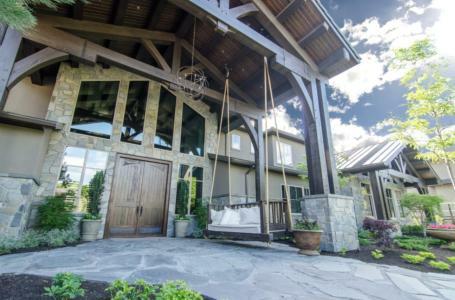 Including a bold timber frame entrance in your building design—or including one as a home renovation project—will make a sound first impression on your guests, while filling you with a sense of pride every time you pull into the driveway. How about adding the timeless touch of timber to your interior? Are you looking for ways to add beauty and value to your home’s exterior? 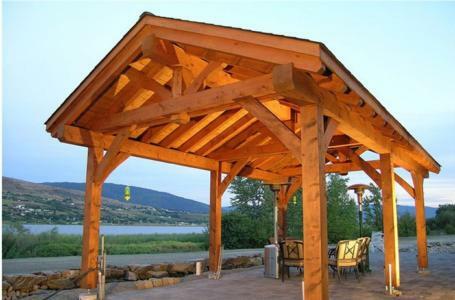 The skilled craftsmen at European Timberframe Corporation in Vernon, BC specialize in everything from timber frame gazebo, pergola and outdoor kitchen structures to post-and-beam decks. Call us to discuss how we can bring your backyard or entranceway to life. Serving Vernon, Kelowna and other communities in the Okanagan and across BC. We also ship across Canada and to the United States.